When I phoned my sister-in-law trying to find out who is the baby in a picture with Mom, I mentioned that Mom looked so old. She said that your mom looked old at 60, long before she should have. Here I am, age 70. My mother stares back at me in the mirror, the same jaw line, the same eyebrows, the same lines about the mouth, but not her coal black hair. 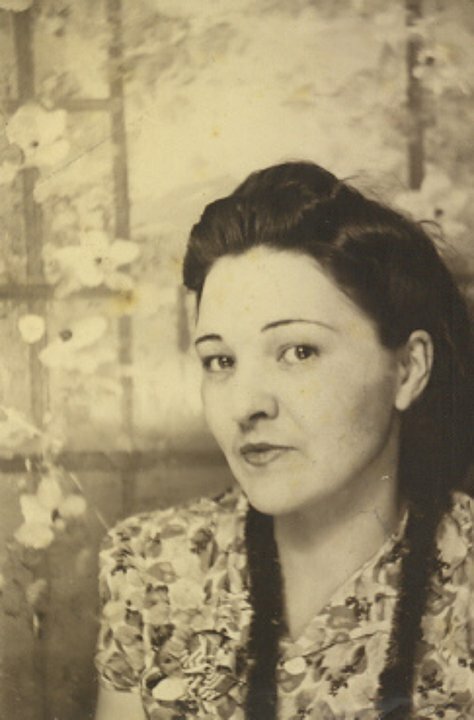 Mother was always proud of the fact that she had never dyed her hair; and for most of her life, my mom’s hair was coal black with at the most just faint streaks of gray. In the last ten years of her life, the black hair became lighter, and the gray more numerous. When mine gets to where about a half-inch of white peeks through and I seem to have more scalp than hair, I dye my hair to almost the color I had when younger, a once luscious brown with amber undertones that would shine in the sun as if hennaed. Now a color 4 something or other that the hair dresser and I pick out. For most of my childhood, my mother’s hair if down streamed down her back, so long that she could sit on it. Only once in a while she would let it drape down her back or across her shoulders. When she sat at the kitchen table, her unbraided hair seemed as if it caressed the floor. But then to let one’s hair display in such a manner was not seen then as proper. Hair needed to be kept up, as mom would say, or hidden under a scarf, which she did occasionally. When she put up her hair, four massive braids, two coils of hair on either side and a part down the middle; when down, two braids with the sides of her hair swept up and away from her face with combs. I often remember her asking me if her hair was fine in back, if a strand was loose to tuck it in. Once a week, usually on a Friday or Saturday, like most farm women then, Mom washed her hair. She would heat rain water on the stove, brought in from a barrel setting under one or another gutter, to a temperature where an elbow could rest comfortably for a short time and then she would wash her hair, the basin full of rain water on the drain of the sink; an empty basin in the sink to catch the water streaming from her hair. Once her hair was shampooed thoroughly, which took a long time for thick hair such as Mom’s, then it was my turn to help, if I was around. Both basins were rinsed clean. One was filled with clean warm rain water to rinse; the other, placed in the sink again. Then I would pour warm rain water onto her hair, and she would work it through, sometimes telling me to take some from the basin below. Then we would rinse again and again until the water was clear in the basin. The final rise would be of vinegar and water to make her hair squeak. Then the absolutely final rinse in cold water. Mom didn’t let her hair dry naturally before she braided, for it was easier to divide the hair when wet into three sections each for each braid and coil. Sometimes she asked me to braid her hair or wrap rubber bands around the ends. Then she would coil the braids counterclockwise, on each side one around the other. I don’t know what doctor Mom consulted and really I don’t know when, but I do think we were still living at the Beh place when the doctor told Mom that her headaches was because of the weight of her hair. She had them cut off, a hefty price to pay, for the headaches continued, her braids like locks of hair to remember someone by in a covered wooden bowl. Mom’s headaches were sometimes conversation among us kids even as we grew older. My younger brother still thinks that Mom wasn’t sick at all. I don’t know why any of us doubted her. Ignorance more than likely, and a lack of empathy.